Today I will teach you how to use the words tarde and atrasado. Both words mean late in English, but they are not interchangeable in Portuguese. This Portuguese lesson will help you get it right from now on. First I’m going to give you an overview of what Atrasado and Tarde mean, so you can understand the difference between these words. Then I will show you real-life examples using the words. Atrasado means that you are running late for something. It means that you were expected to be somewhere at an earlier time or something is beginning after the scheduled time. For example, yesterday I was supposed to meet with a friend at noon. I got there at 12:25PM, so I was late (atrasada) for our meeting. This is key to understanding when to use Atrasado instead of Tarde. Tarde means a late hour. It doesn’t mean that you are running late or that something is happening later that it was scheduled to happen. For example, yesterday I went to bed at 11:30PM. I went to bed late (tarde), but I wasn’t late (atrasada) for anything. Let me show you real-life examples of the two words in use. Quase meia-noite! Está tarde. Preciso ir. = “Almost midnight! It’s late. I need to go. Gustavo: Vamos ao cinema hoje? Que tal a sessão das 9:45? Taciana: 9:45 é muito tarde. Prefiro ir mais cedo. Gustavo: Let’s go to the movies tonight. How about the 9:45 session? Taciana: 9:45 is too late. I’d rather go earlier. Taciana: Tá ficando tarde. Tenho que ir embora. = It’s getting late. I have to go home. Tarde can be used with action verbs for actions that happen at a late hour or time. Notice, however, that the example below doesn’t indicate that something happened later than it was scheduled to happen. It simply happened at a late hour. Fabiana: A festa terminou tarde ontem? Taciana: Terminou super tarde, lá pelas 3 da madrugada. Fabiana: Did the party end late yesterday? Taciana: It ended super late, around 3AM. This lesson has everything you need to say the time right in Portuguese. In the examples above, things were happening at a late hour, but they were not happening after a scheduled time. Use Atrasado when someone is running late for a scheduled commitment. It is worth repeating that this is the key difference between tarde and atrasado. Atrasado = after the scheduled time. Tenho uma reunião importante hoje. Não posso chegar atrasada. = I have an important meeting today. I can’t be late. Cara, você está meia hora atrasado de novo. = Dude, you’re half an hour late again. Gerente: O seu relatório de vendas está atrasado outra vez, João. Já devia estar pronto desde a semana passada. Manager: Your sales report is late again, João. It should have already been ready since last week. Gustavo: Você vai ao jantar da Sílvia hoje à noite? Taciana: Vou, mas vou chegar atrasada porque vou trabalhar até tarde. Gustavo: Are you going to Sílvia’s dinner tonight? Taciana: Yes, but I will get there late (=after the scheduled time) because I’m going to work until late. Keep this in mind: You are never tarde. You can never say that a person is tarde. A person can be atrasado/a. 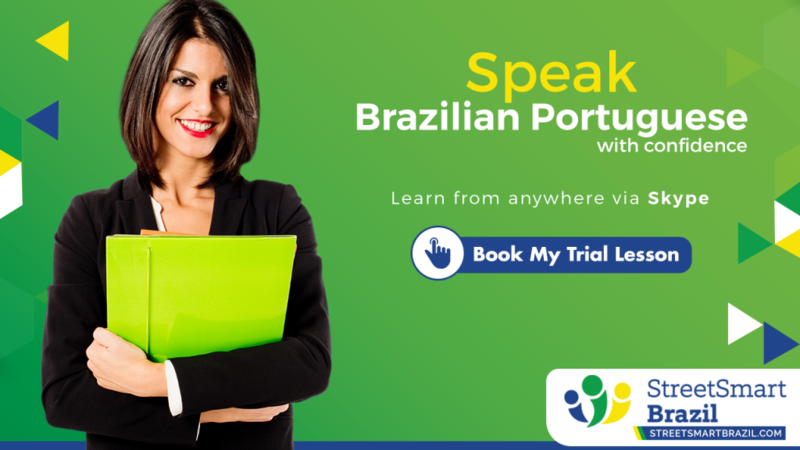 Speak Portuguese with confidence. 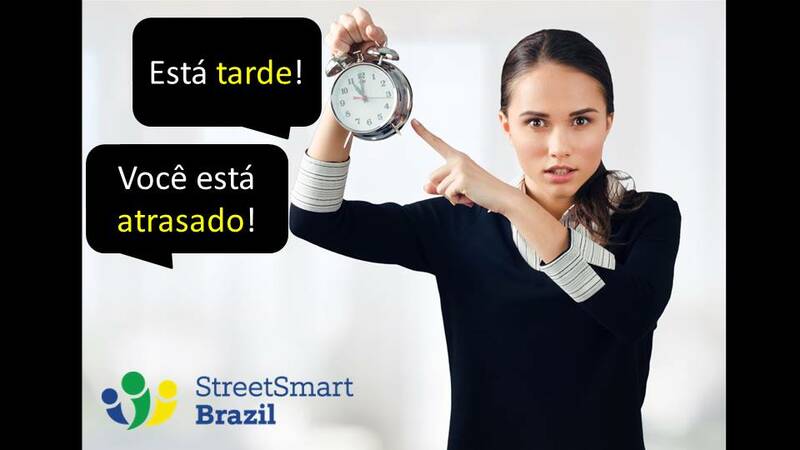 Learn and practice with a Street Smart Brazil professional instructor. Shop for Portuguese lessons today. What about cedo? Can people and actions be cedo? Actions can definitely be cedo. A festa vai começar cedo. Cheguei cedo para a reunião. Acordei muito cedo hoje. But we don’t really say that we are cedo. I’d say: Estou adiantada. Or: Cheguei cedo.